A political expert says the recent massacre in the Syrian town of Khan al-Assal was a Western-backed measure to cover up the militants’ use of chemical weapons there back in March, Press TV reports. Cunningham cited reports revealing that the Western-backed al-Qaeda-linked militants had been found in possession of the nerve agent sarin on Turkish soil. He also quoted a June Washington Post report on a US military program in Jordan aimed at training the Jordanian military in the handling of chemical weapons. He pointed to a Russian investigation that found Western-backed militants were behind the March chemical attack, which prompted the UN investigators to meet with Syrian authorities, where they promised a forthcoming in-depth investigation. 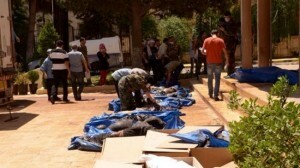 Cunningham explained that such an investigation would have involved collecting samples and interviewing witnesses in Khan al-Assal about what happened during the attack on March 19, and would have most likely agreed with the Russian study, which found anti-Syria militants behind the mass murder. This, the expert said, confirms that Western-sponsored terror groups have been using these weapons with the full or tacit knowledge of Western governments and their military agencies. “Given this potentially damning picture that was forming around Khan al-Assal, it is not implausible that Western-backed death squads were dispatched on the town last weekend in a desperate attempt to exterminate any remaining witnesses to the first massacre with chemical weapons,” he proposed. “For the Western sponsors of genocide in Syria, the stakes could not have been higher on that particular truth coming out. That is why the truth had to be massacred,” Cunningham concluded. 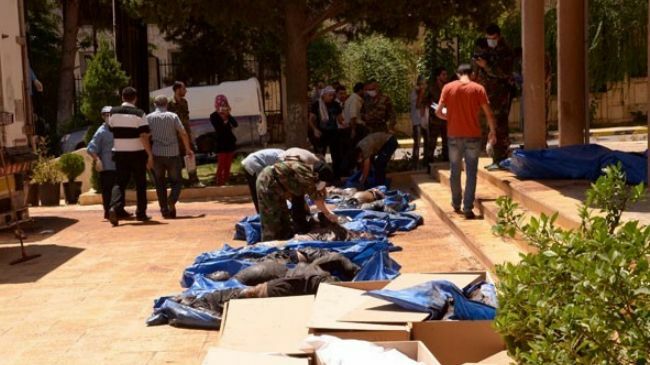 In late July, armed terrorist groups killed at least 123 people, mostly civilians but also including military personnel, during an attack on Khan al-Assal, in Aleppo Governorate. They mutilated the corpses, throwing them into a crater outside town and incinerated the bodies of a number of other victims. Up to 30 people were killed and some 100 others were also seriously injured on March 19, when the town was hit by a chemical attack that involved the deadly nerve agent, sarin. The massacre came as Western powers and their regional allies – including the Israeli regime, Turkey, Saudi Arabia and Qatar – continue to support militant groups, including al-Qaeda-linked terrorists, in Syria. The Arab country has been gripped by deadly unrest since 2011. The UN says more than 100,000 people have been killed and millions of others displaced in the violence.